WARNING: THIS PROCEDURE MAY BE EASY(OR NOT SO EASY) BUT IS VERY RISKY AND VOIDS YOUR WARRANTY, DO IT AT YOUR OWN RISK. I OR THIS BLOG WILL NOT BE RESPONSIBLE FOR ANY CALAMITY! ITS YOUR OWN TAKE! I have a black N9 64GB, Made in Finland, UAE version and I am using it in India! 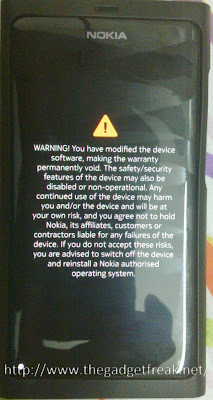 Nokia is trying its best to push, rub and force LUMIA on us in India but I went for the N9! Saturday morning, I woke up with the Firmware Update news that flashed on my N9. While many of you have already received the update, UAE versions got the PR1.2 only on 10th March! Okay, so I was ready to go until I saw the dreadful message that the Memory is Full!! I thought this was gone with the E72, but the Legacy lives on... Seriously Nokia, when are you going to start thinking about Memory limits properly? I dont know how they come up with these figures for Memory. 4GB? For Apps? And Lo! I have a 64GB Phone and it says Memory Full! Just imagine, there are less apps for the Meego OS in store now, what if there were many? 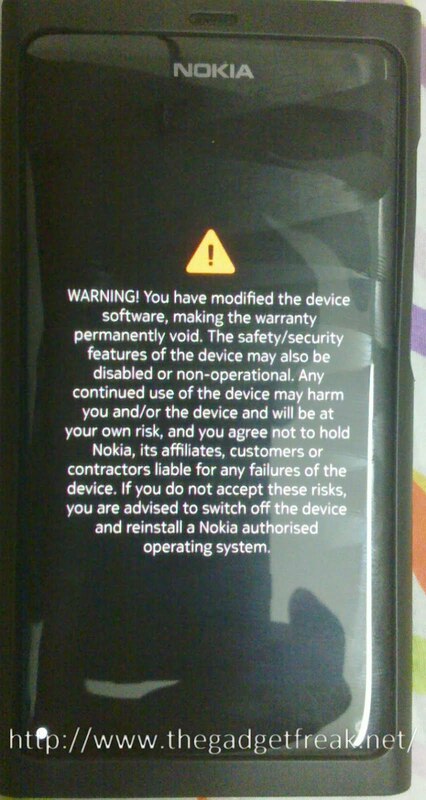 This is a deliberate Suicide by Nokia... Anyways, God only can save Nokia from the Dictators! So I hit the net and saw very less information about the partition resize for Nokia N9. I got two sources for this and using those hints I resized the Partitions on the N9. I did not want to take the pain of uninstalling apps and maintain a list of those apps and install em again.... Also I did understand that I can only re-install paid apps for 5 times in the Nokia Store... So I did not want to uninstall the apps. I thank the people at these two sources for helping me out. Though the instructions are for installing Nemo, this site was very handy for me to learn and use the tool "parted". Also It was very helpful to get the files used to load the N9 partitions. The user "kuzmichov" gives a clear explanation of how this is done except for the loading partition part! 1) You will need a Linux system with parted and/or partitionmanager installed. 2) You will need the following files as mentioned in Source1, except for the Nemo files. 3) You can follow the first 8 steps as on source1. Please open terminal and "cd" to the directory where you downloaded the above files. 1. Unplug the usb cable from your phone. 2. Turn your phone off. 4. Insert the usb cable. 5. Wait about minute until a new USB mass storage decice appears on the host. 4) After this, you can use either parted or partitionmanager to do the job. Make sure you unmount the partitions first! The little lock shown on the partition manager shows its already mount, you can right click and unlock it there itself. 5) Source 2 gives a good idea on how PartitionManager works. I personally think parted may be better if you know how to use it. But PartitionManager does the job. For me Partition Manager had left some free space after partitioning(very minor) which I tried to resize again and include using parted. The whole job of resizing took around 2 hrs. 7) Just to give you an idea of how my space now looks like, please find the screenshots below. 8) And yes, after doing this I was able to update my N9 to PR1.2. Now My Applications Partition size is around 10.8 GB which is great! Notice the sectors between the end of (2) and start of (3). Thanks to PartitionManager some minor space there is lost. I Hope this is of help to anyone who needs to repartition his N9. It's under the Mods/Tweaks section. One of the threads that was your inspiration is already referenced there. Is this real? can i really do this on my nokia n9? will i lose my files after this? Yes its very much true and its possible, but however it does have some issues. For me, I faced a security issue - My phone no longer asked for the security code whenever I unlocked the phone. Initially I dint think it was because of this, but eventually found it out. I reverted back to the original partitions but did not lose any data, just had to reinstall the apps. I lost my N9 64gb and would request if you couls sell me urs or arrange one for me. maybe u might reply late, but pls reply back on my mail khandelwal.bharat@gmail.com, or contact me on 9972723033.
anyone else also having a Nokia N9 for sale 64gb one may contact me. Sorry to hear about your loss, Bharat. I'm still using my N9, it's not for sale. Hi, I'm a passionate Christian and a passionate developer. I love God first and then the world of technology. My craze for being a techie prevented me from doing an MBA though I had a chance. I am now a mainframe developer looking for developement on the Symbian platform. Symbian and Linux arnt new to me, they were the guys who got me a job as a fresher. Now I'm looking at polishing the dust off my old linux and Symbian knowledge. My craze for technology and gadgets drove me to start this blog. I thank God for enabling me to do this. Happy reading! Thanks for visiting. Ajit.